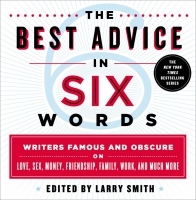 Bolstered by the success of the memoir form, Larry Smith is back again with a poignant collection of universal wisdom, life lessons, and caution thrown to the wind that will put a smile on your face six words at a time. With contributions from celebrities like Molly Ringwald, 'post-adolescent? Then stop blaming your parents;' Lemony Snicket, 'never, ever refuse a breath mint;' and Gary Shteyngart, 'hands where I can see 'em,' as well as everyday people who've learned a thing or two about a thing or two during their time on the planet, readers will pulled into the sometimes hilarious, often serious, occassionally reflective experience of the book. Smith's curated advice book is the straight-shooting, truth-telling, next door neighbour everybody wishes they had access to growing up. Now they do! Here's six more life-changing words of advice for you: Read this; you won't regret it. In 2006 Larry Smith, the creator of SMITH Magazine, challenged readers to tell their story in just six words. Modeled after a famous quote by Ernest Hemingway, Smith showed the world that short-form story-telling could be powerful. Since the publication of the first book in his bestselling series, Not Quite What I Was Planning, people all over the world have shared their stories in print, online, in the classroom, and with their friends and families.